Built in the early part of the 20th century, the former P.S. 64 has seen wave upon wave of new New Yorkers. Beginning in 1977, led by a pair of community-based organizations, Adopt-A-Building and CHARAS, the building was transformed into a community center known as El Bohio. The grass-roots initiative mirrored a local and nationwide citizen-led rebirth of urban centers and helped to catalyze the revitalization of the surrounding "Loisaida." P.S. 64/El Bohio was not the only building that New Yorkers saved from destruction in the 1970s and returned to productive use. Its special significance is in its identity as a public building, dedicated to the revival of community and of cultural survival. As such, P.S. 64/El Bohio long has been recognized by many as one of the principal places to embody these historical events. The occupation and revitalization of P.S. 64/El Bohio took place in the context of widespread disinvestment, property abandonment, and arson in the Lower East Side and many other poor areas of the city during the 1970s and 1980s. As described by scholar Christopher Mele, "The decade of the 1970s played out as a continuous withdrawal from Loisaida of real estate capital and people, punctuated by the efforts of remaining residents to stabilize their streets and homes." (Loisaida is the name that community activists gave in the 1970s to the area between Avenues A and D and Houston and 14th streets. They intended the name to encourage visionary community action and Latino pride.) Citywide, some 20 percent of residential buildings were in or at risk of tax foreclosure, known as being in rem, by the end of the '70s. Within Loisaida, the percentage was even higher, and the area's population fell dramatically. As this crisis grew, organizations that had been founded in the 1960s in response to the social ills of those times matured. These included groups like CHARAS and Adopt-A-Building. Such organizations could be found throughout the city, helping to pioneer a broad-based, self-help community preservation movement that took root in the Lower East Side as well as in Central and East Harlem, the many neighborhoods of the South Bronx, Brownsville, Bedford Stuyvesant, and so on. Many of the nonprofit groups that contributed to this social movement have disappeared, but a number of them continue to this day: examples include the Cooper Square Committee, in the Lower East Side; Nos Quedamos, in the Bronx; Bedford Stuyvesant Restoration Corporation, in Brooklyn; and the Green Guerillas and Urban Homesteading Assistance Board citywide. It is important to note that the community-based organizations that contributed to this preservation movement were in many cases interacting with public officials and agencies, supported by public monies, and empowered by law or public policy. This is not to suggest that community organizations and city, state, or federal officials always agreed with each other--far from it. Rather, it suggests that the community preservation movement of the 1970s and '80s is part of the full New York City history, not just associated with the particular communities that were most affected. In the mid 1970s, as the nonprofit Adopt-A-Building negotiated with the city to use the P.S. 64 building, the Board of Education left the building, and vandals stripped it. In 1976 or 1977, Adopt-A-Building took over and renovated the P.S. 64 building as a headquarters. Since the organization had recently won a federal Comprehensive Employment Training Act (CETA) grant, its staff was approaching 100 people, and it needed more space. Adopt-A-Building put its new CETA trainees to work on the building, gaining at once a place to house the trainee corps and a massive training project. Under the supervision of licensed professionals hired by Adopt-A-Building, CETA trainees restored the building to use. They pumped the water out of the boiler room. A grant from the Consumer Farmer Foundation helped them restore the heat. They restored phone service to the building (this was an old-fashioned, manned switchboard with plugs). They transformed former classrooms into offices, repaired walls, floors, and ceilings, and sealed off dangerous spaces. The first phase of building repairs extended through 1978, when the rest of the Adopt-A-Building staff moved in. Over subsequent years the repairs continued. City funds paid for at least partial repairs to the roof. In about 1981, a former leader says, Adopt-A-Building moved out. After that, CHARAS managed El Bohio's affairs and facility issues. Other significant renovations continued to take place until the building was sold by the city in the late 1990s to a developer. Adopt-A-Building was organized in East Harlem during the winter of 1970. It grew out of voluntary efforts organized by the Rev. Norman Eddy, who had actively aided low-income residents of the "Metro North" area of East Harlem since about 1960 in their efforts to improve housing and social conditions in their neighborhood. Eddy and his neighborhood collaborators believed in the power of self-help and self-determination, and initiated some of the first community-based planning and housing rehabilitation in the nation. By 1974, Adopt-A-Building's headquarters moved to the Lower East Side. The organization involved itself in the following activities: tenant information and organizing; litigation on behalf of tenants; tenant management and ownership of buildings; sweat equity (self-help renovations); organization of block associations; energy conservation; neighborhood planning; and job training. CHARAS is the continuation of an earlier group known as the Real Great Society, formed in 1964 by five young Puerto Rican men: Carlos (Chino) Garcia, Armando Perez, Rabbit Nazario (who later involved himself with Adopt-A-Building), Angelo Gonzalez, and Papo Giordani. According to a Life magazine article written in 1965 about the Real Great Society, most of the young men had been youth gang leaders but made the conscious decision at this point in their lives to deploy their leadership skills and political ideals in more positive directions. As well as opening small businesses and teaching, they worked with R. Buckminster Fuller to study and build geodesic domes. In 1971, according to The New York Times, the group changed its name to CHARAS, an acronym made from its members' names. CHARAS gained a reputation for innovation and creativity, and based in PS 64/El Bohio from 1979 on, earned particular notice for fostering community-based urban ecology, and arts and culture. It also sponsored after-school programs and a variety of physical fitness programs. CHARAS and its members have been called "pioneers in urban ecology." In Loisaida, the practices of urban ecology--broadly defined to include community gardens, which have been especially popular, alternative technologies, recycling, and other efforts--attracted many adherents whose largely voluntary labors got many innovative projects off the ground. El Bohio fostered a remarkable number and variety of arts and cultural projects. Outside of the Lower East Side's venerable settlement houses, such as Henry St. Settlement, El Bohio probably did more for the arts in this part of the city (an area known for artistic innovation) than any other institution. The auditorium at El Bohio hosted cultural performances. The art gallery was called La Galeria en El Bohio, and the large gymnasium offered rehearsal space. CHARAS-sponsored arts programs included Grupo Ache Dance Company, Latin Dance and Ballet Workshops, New Music Series, Visual Arts/Media Programs, Teatro Charas, and Photography Workshops. Other artists and cultural activists rented out studio space in El Bohio, and the building hosted a number of other organizations. These included Marlis Momber, a noted documentary photographer; Keith Haring; Bread & Puppet Theater; Ninth Street Theater; the Loisaida magazine, Quality of Life; and the Seven Loaves Community Arts Coalition. CHARAS also used the space in 1985 and 1987 to hold successful art auctions as benefits. Mainstream artists and performers like Jean-Michel Basquiat, Andy Warhol, Keith Haring, Lee Quinones, Futura 2000, Jenny Holzer, and Elizabeth Murray participated. Another organization, Films CHARAS, founded in 1981 by Doris Kornish, who founded Pioneer Theater, and Matthew Seig, showed early films of now-noted directors like John Sayles, Todd Haynes, and Spike Lee. Actor Luis Guzman's first film role was in a movie partially shot at El Bohio. The screenings ran for 18 years and provided an important public forum for independently made films. Roger Vaughan, "The Real Great Society," Life (September 1967). Syeus Mottel, The Improbable Dome Builders. (New York: Drake Publishing, 1973). Liz Sevcenko, "The Making of Loisaida," in Augustin Lao-Montes and Arlene Davila, ed., Mambo Montage. (Columbia University Press, 2001). Ruth Nazario and Sally Tully, eds., A Portrait of Loisaida. (Interfaith Adopt-A-Building, 1978). Christopher Mele, Selling the Lower East Side. (Minneapolis: University of Minnesota Press, 2000). Mario Maffi, "Culture in Loisaida," in Janet Abu-Lughod, ed., From Urban Village to East Village. (Oxford: Blackwell, 1994). The following people provided information to Place Matters about P.S. 64/El Bohio: Miguel Algarin; Dan Chodorkoff; Harriet Cohen; Linda Cohen; Maria Dominguez; Chino Garcia; Herman Hewitt; Doris Kornish; Tato Laviera; Lenny Lebreezi; Roland Legiardi-Laura; Maryanne Momforton; Ruth Nazario; Michael Rosen; Andy Stone and Joanne Morse; Marianne Perez; Edgardo Vega; and Jane Weissman. East Village Community Coalition "P.S. 64 - CHARAS, El Bohio: A History "
Ground was broken on June 12, 1904, for the city's newest public school construction project, just three days before the worst civilian disaster in American history (prior to 9/11). More than 1,000 people, mostly women and children, died when the General Slocum, a ferry boat on holiday duty, burned and ran aground on North Brother Island in the East River. Despairing remnants of families moved away by the hundreds, and by the time P.S. 64 opened its doors in the fall of 1906, the churning Lower East Side had ceded this plot of land to the latest wave of immigration, Jews from Eastern Europe. C.B.J. Snyder, New York City's brilliant and prolific master designer of public schools, was in his prime. With each new building, Snyder refined his vision and added important innovations. P.S. 64 would be no exception. Rendered in the popular Beaux Arts style of the day, the school was laid out according to Snyder's recently developed H-plan. With P.S. 64, Snyder introduced yet another jewel in his crown of educational innovation: The ground floor auditorium. The problem he addressed with this simple and elegant stroke of design was assimilation. By providing free public assembly space, not just the children but the parents, as well, could enjoy the fruits of our society and learn its meaning. The first time we read about P.S. 64 is in December 1907. The barely year-old school had become one of the hosts for a myriad of free lectures offered around the city. On a given night on East 9th street you might find yourself sharing a packed auditorium listening to speakers like A. V. Williams Jackson recite Persian mystic poetry, or Dr. Edwin E. Slossen expound on the Panama Canal. During the summer of 1911, P.S. 64 became the first public school in the city to offer free open-air professional theater to the public. 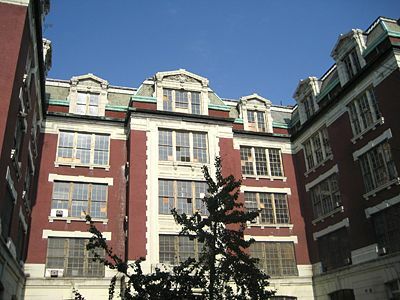 One of the reasons the school was chosen to premiere the series is because it was the first school in the city to have electric lights in its yard. n the 1920's, P.S. 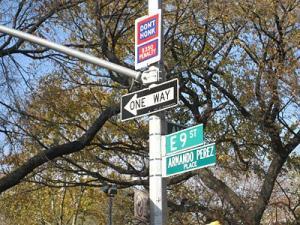 64 was a required stop for politicians campaigning in New York City. Governor Alfred E. Smith, Mayor Jimmy Walker, and Franklin Delano Roosevelt all recognized how important it was to make time to speak in the school's auditorium. Walker railed against his opponent, then-Mayor Hylan, Governor Smith confronted the Hearst news empire, and Roosevelt assessed his strength with Jewish voters by the neighborhood turnout for his speech at P.S. 64. Beginning with the school's second principal, William E. Grady, P.S. 64 became known as a place of educational innovation and experimentation. Grady, who rose to the post of associate superintendent of the city school system, used P.S. 64 to develop and test what became known as the Ettinger Plan. In the years just prior to WWI there was a fierce battle to make schooling mimic a model of corporate efficiency and productivity. From the school efficiency battles of the pre-war years grew the psychological and intelligence testing movement of the early '20s. A young educational innovator, Elizabeth Irwin (the founder of the famous Little Red Schoolhouse in Manhattan), worked at P.S. 64 from 1912 until 1921. While there, she devised a classification system for students predicated on the scores of their IQ tests. The controversial program won acceptance based on its success at P.S. 64. P.S. 64 burst into the newspapers again in 1950. This time, two teachers from 64 out of a group of eight citywide were accused by the Board of Education of being Communists. The superintendent of schools, Dr. William Jensen, began the spectacle by suspending the teachers without pay. The hearings, complete with secret witnesses, noisy protests, a gaggle of lawyers, and culminating administrative trials, stretched into early 1951, when all eight were judged culpable and dismissed from their positions. 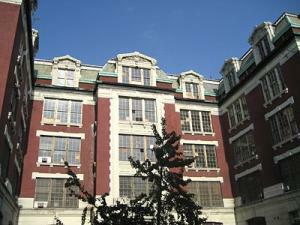 Throughout its significant history as a school, P.S. 64 was consistently turning out wonderful young students. Perhaps no public grade school played a greater role in guiding and shaping the creative dreams of immigrant children. Yip Harburg, the man who wrote the lyrics to The Wizard of Oz and such classic songs as Brother Can You Spare a Dime and April in Paris; Sam Levene, the great comic actor; Morris Green, who produced Cole Porter's Greenwich Village Follies and the Broadway version of Eugene O'Neill's Desire Under the Elms; and Joseph Mankiewicz, Oscar-winning screenwriter, producer, and director who made such films as All About Eve and The Philadelphia Story, all went to P.S. 64. Finally, in the late 1970s, when the population of the neighborhood could no longer support the school, it closed. But shortly after its doors shut, they were reopened, and the cultural work of the building continued. For the next 20 years, the old school building was known as CHARAS/El Bohio, a vibrant community arts and education center. Spike Lee screened his first student film in the auditorium, Luis Guzman and John Leguizamo performed on the stage, choreographers rehearsed in the classrooms, painters created studios out of the empty spaces, children studied poetry and martial arts, and everyone still felt as they had almost 100 years earlier: that this building, this space, welcomed and nurtured them. Even now, as the building has become an object of sharp contention and controversy since it passed from the hands of the community to a developer in 2001, it still accurately reflects the struggles of the neighborhood people to determine and to enrich the direction of their lives. Visit http://www.evccnyc.org/history.php for a more full history. A center offering affordable rehearsal, performance and exhibit space for artists, with a long history of social activism. Founded by a Latino gang, The Dragons, it was a key player in the anti-poverty movement through its "Real Great Society."